On August 21, 2017, the day will briefly turn into night as the sun will disappear behind the moon during a total solar eclipse over the United States. ForeFlight has several options for viewing custom content, helping you pinpoint the path of this rare event (the last total solar eclipse was in 1991!) and fly to an ideal spot to catch this once in a lifetime experience from the best vantage point. You can easily import custom content like User Waypoints or User Map Layers from the Apple Mail app, your browser, the Dropbox app, or send directly to your iPad or iPhone via AirDrop. NASA’s eclipse website has several shapefiles and eclipse coordinates available for download at no cost. After you import your custom data, select your file either from the User Content tab available in the More view or from the bottom right of the layer selector in the Maps view. As eclipse day approaches, see where the weather will be clearest using ForeFlight’s industry-leading imagery collection, and remember to add the proper eye protection to your flight bag! Team ForeFlight will be on hand at the 2016 NBAA Schedulers & Dispatchers Conference this week—stop by and visit with Jamie and Linda in Booth #100. Products on demonstration include ForeFlight’s FBO Directory, ForeFlight Web (our web-based flight planning platform), and JetFuelX (a planning tool that helps operators manage contract fuel memberships). More than 2700 FBO locations are mapped on ForeFlight Taxi Charts. Featured listings are highlighted in yellow and pilots can access listing details right from the taxi chart view. Corporate, fractional, and charter operators use ForeFlight everyday for fuel stop and destination planning, and they are thrilled with our new FBOs on Taxi Charts feature. FBOs on Taxi Charts allow pilots to see exactly where your business is located on the field and to access FBO Directory listings right from the taxi chart view. As an FBO, you have the opportunity to enhance your listing in the most widely used aviation app so that your business stands out above the rest. At the exhibit, we can show you a live demo of what your business listing looks like and what our customers see in real-time. In addition, check out this article from Linda Street-Ely, our ForeFlight Directory Manager, for pro tips on the features of Directory. We also recently announced the acquisition of JetFuelX—a free web–based fuel card management service that makes it easy for owners and operators of turbine aircraft to save money by quickly finding the lowest prices available from their multiple jet fuel discount program memberships. FBOs and fuel providers benefit, too, as you can build your fuel discount program membership and efficiently distribute pricing data to customers. If you are interested in integrating your fuel discount program, contact info@jetfuelx.com to learn more. 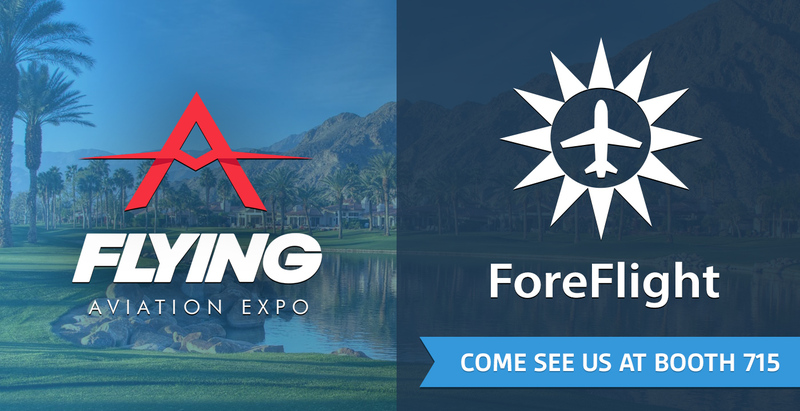 This week Team ForeFlight heads to the second annual FLYING Aviation Expo in Palm Springs, California. Janessa and Thomas will be on hand in the ForeFlight booth (#715), ready to demonstrate all of the latest ForeFlight features, offer tips and tricks to make you a ForeFlight super-user, and answer any how-to questions you may have. Thomas is presenting our ForeFlight 201—Advanced Flying with ForeFlight seminar each day of the show. This presentation is an advanced, scenario-based course and you will learn how to use the app to its fullest from planning to inflight navigation. As a veteran of this and other cross-country air races, I was thrilled to participate in the Air Race Classic starting events in Fredericksburg, Virginia. Visiting with Pilots Jessie Davidson, Topaz Grabman, and Emma Sullivan from Above All Aviation. These ladies are strategizing for a win! The Air Race Classic has its roots in the first Women’s National Air Derby, held in 1929, when twenty female pilots set out to prove to the world that air racing was not just a sport for men. Beginning in Santa Monica, California they flew over 2,800 miles to the finish line—the National Air Races in Cleveland, Ohio. From that event, the Ninety-Nines were formed, as ninety-nine of the then 117 licensed female pilots organized to promote flying, friendship, and freedom around the world. Air Race Classic, Inc. continues the tradition of this historic race. With airplanes and logbooks impounded for meticulous inspection by members of AWAM (Association for Women in Aviation Maintenance), anticipation and excitement built over the weekend as the 51 race teams gathered for three days of pre-race briefings. During the briefings I shared with racers how to get the most out of ForeFlight features such as our new weather imagery for better forecast planning, user waypoints, and annotating taxi diagrams with race time lines. It was fun to share my experience in what goes into creating a strategy for this race. Each airplane is ‘handicapped’ to provide the best way possible to make all airplanes equally competitive. During the handicap flight the plane is flown full throttle on a rectangular course at a specific altitude. Vents are closed and engines are leaned for best performance. This levels the playing field and so the race becomes one of pilot skill and strategy rather than the raw speed of the fastest airplane, as it was in 1929. As an Air Race Classic racer myself, I can tell you that the best strategy is to scrutinize the weather each day of the race and capture the best possible winds on the best possible days. Sometimes that means not flying on a day of headwinds if more favorable weather is forecast. As long as the course is completed in the four days allowed, how many of the legs are flown each day is up to each race team. There are some other fine-tuned race strategies I have used, but you’ll have to be my race partner to find out what those are! My ultimate advice: fly straight, fly fast. This year’s 2400 mile race forms a star pattern. On Monday, the clock started against the 111 racers. The day VFR race legs total more than 2,400 miles. The race route is different each year; this year’s path draws a sort of star pattern, with the required timed legs going first to Hickory, NC, then Connellsville, PA, Jeffersonville, IN, Kalamazoo, MI, Lawrenceville, IL, Kirksville, MO, Union City, TN, and Gadsden, AL, and crossing the finish line at Fairhope, AL. Those who crossed the starting timeline have until 5:00 pm EDT Thursday to finish the course. Engineers and rocket scientists who work for companies like Scaled Composites and Virgin Galactic, airline pilots, and airport managers, artists, singers, veterinarians, and retirees, and more people with fascinating backgrounds are in this race. Seventeen collegiate teams from around the country are vying not only for the coveted first place prize, but the chance to finish ahead of all other competing schools. Unfortunately not all registered teams arrived for the start, as weather kept four race teams from reaching Fredericksburg. Another nerve-trying situation occurred at the start when Team 54, Terry Kane and Roxanne Ostrowski, returned from the starting line with a low voltage light. To remain contenders, they had three hours to secure the parts, complete repairs, and fly the timeline to start the race. I’m happy to report that they beat the clock and are still in the competition! As the race teams navigate through the challenging race course, Team ForeFlight sends its best wishes for a safe and exciting adventure! Find out more about the race teams here, and join us as we track their progress here. Last month we participated in Sporty’s Annual Fly-In and enjoyed free food, fellowship, flying—and a special surprise. Always a highlight of the event is the announcement of the airplane sweepstakes winner. Sporty’s customers are automatically entered into the sweepstakes each time they make a purchase. This year that winner was Rick Okikawa from Sacramento, California. Rick’s winning purchase was a ForeFlight subscription bought on a whim when he ran into his flight instructor one day. Rick considers himself new to flying, having started part-time about three years ago flying with the Cal-Aggie Flying Farmers out of the University of California Davis. In July of 2014 he sealed the deal, completing his flight training and becoming a licensed pilot. When I asked him about the winning phone call he received from Sporty’s, he said he thought it was a scam at first. And who could blame him? It’s not every day you get a call from someone trying to give you a new airplane! We thank Sporty’s for another unforgettable fly-in; we had a great time and it’s an event we’re sure Rick won’t forget either. 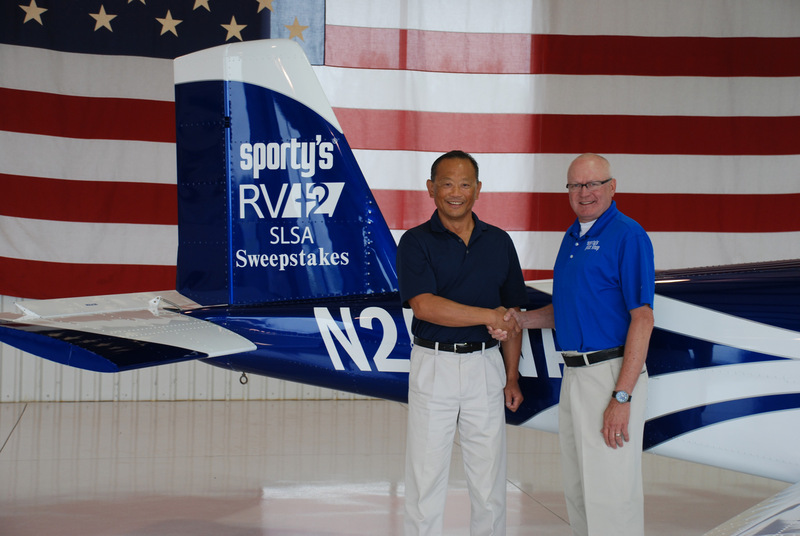 Congratulations, Rick—wishing you blue skies in the new RV-12! Spring is in the air and so are we—this weekend ForeFlight team members are flying to Salinas, California for AOPA’s opening fly-in and Batavia, Ohio for Sporty’s annual event. We’re proud to support AOPA’s second year of events that celebrate grassroots aviation. Visit with Josh and Thomas at booth #57 and experience new ForeFlight Mobile features like Procedure Preview, FBOs on Taxi Charts, and Synthetic Vision. The Clermont County Airport may be small, but this fly-in is big. Education seminars, a hot dog lunch, the RV-12 sweepstakes winner announcement, and more make this a fun day for all. ForeFlight team members Susan and Jason will be on hand to demonstrate the latest ForeFlight features. In addition, Jason (ForeFlight co-founder and CTO) presents “The Latest from ForeFlight” at 1:30 pm. This week ForeFlight team members are participating in the Comply365 Third Annual Connections365 education and networking conference in Dallas, Texas. Comply365 serves many industries, including aviation, as a leader in mobile enterprise optimization software. We are pleased to announce two integrations with Comply365 that simplify operations for flight departments. Comply365 dashboard with quick link to ForeFlight Mobile. Comply365 Connector for ForeFlight Mobile is a software solution that enables a seamless first time sign-on and authentication capability for ForeFlight Mobile via Comply365’s MyMobile365 dashboard. The solution simplifies deployment of ForeFlight Mobile to large enterprise pilot groups. Customers using the Comply365 Connector tap a ForeFlight icon on the MyMobile365 dashboard and pilots are immediately authorized to use ForeFlight Mobile without additional setup steps. 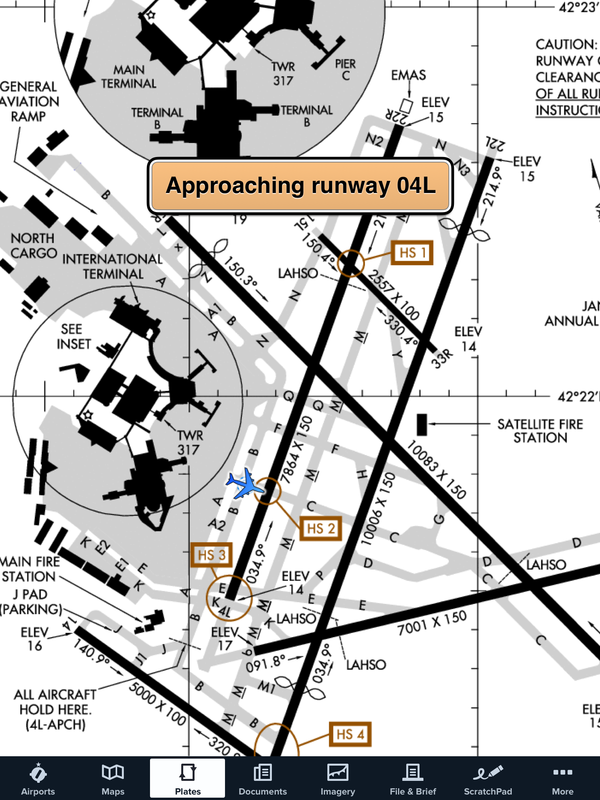 Ownship position shown with ForeFlight Mobile’s runway proximity advisor. In addition to the Connector, ForeFlight and Comply365 collaborated on a solution to simplify the processes required to obtain FAA authorization for the display of aircraft Ownship position on airport maps. ForeFlight’s Taxi Data Recorder (built upon the Track Log platform) collects GPS taxi data from many pilots within an operation, uploads the data to the cloud, and exports it into the Comply365 MyMobile365 dashboard. The Taxi Data Recorder dashboard makes it easy to start workflows and support analysis for Airport Moving Map Ownship approvals. At ForeFlight, we are always excited about finding ways to make a pilot’s work simpler and to make flight operations safer. Expanding the capability of our Taxi Data Recorder to Comply365 customers gives those operators a powerful solution to simplify the data collection and analysis work required to support Ownship authorization. The ability to have Ownship position for ground operations increases situational awareness and could lead to reduced runway incursions. We look forward to more innovations with Comply365 to make customers more productive and efficient. If you are interested in using the ForeFlight Mobile Taxi Data Recorder to pursue Ownship position authorization, contact us at team@foreflight.com. Be sure to make room in your agenda for one of our scheduled Education Forums at EAA AirVenture 2014. Get a full hour of in-depth training on flying with iPad, ForeFlight Mobile, and Stratus, as well as updates on the latest features. Using real-world flight scenarios we’ll walk you through how to use ForeFlight Mobile during each phase of flight. Click here to view the full schedule of events on the AirVenture website. The ForeFlight exhibit will be in Hangar A, #1147-1148. See you at AirVenture! 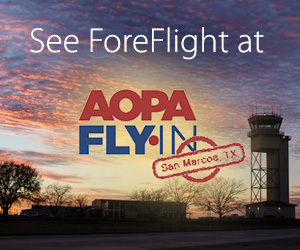 Visit with Team ForeFlight at the San Marcos, TX AOPA Fly-In on Saturday, April 26, 2014. We’ll be in the exhibitor tent ready to show you all the great features in ForeFlight Mobile and answer any questions you may have. Learn about ForeFlight Mobile 6, the Stratus 2 ADS-B receiver, our new airport diagrams, and more. See you there!